This post is especially meant for beginner P6 users. Some of our readers shared they can’t fix the baseline to stay on the original planned data. The baseline dates move every time whenever the data date is changed. This is because you has not defined the Project Baseline. Open your project, then go to “Project” on menu bar, then select “Assign Baselines” tag. See below. 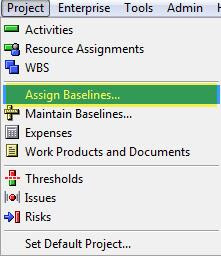 “Assign Baselines” window will appear as below. It indicates that a baseline has not been defined. (A) Select “Add” to create a new baseline, See Fig-2 below. Let assume that you have a single project shown below so as to facilitate this tutorial. (B) Choose “Save a copy of the current project as a new baseline”. See Fig-2 below. 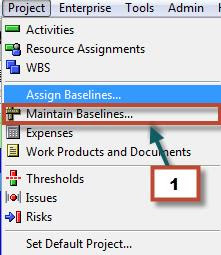 TIP: P6 will ask you to choose the two options for maintaining baseline when you try to add a new baseline. Choose this option when you want to save a new baseline using that current project for the first time before changing data date or updating progress. Assuming that you want to define a baseline of current project using another project, see below. (C) Choose “Convert another project to a new baseline of the current project” in this case. See Fig-2 above. TIP: Choose this option when converting another project to a baseline of current progress project. Prior to converting, remember to make a copy of that project so as to get access in future. It is no longer visible in the project list once you convert it to a baseline. Of course, you still can make it visible as a separate project in the project list by “Restore” baseline function. 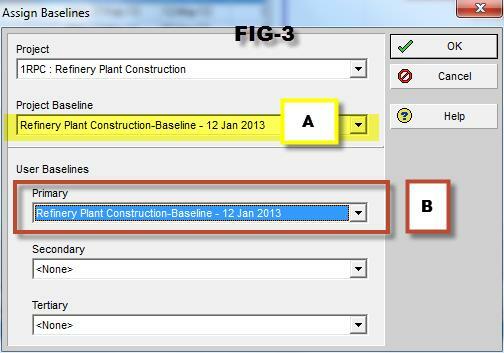 Make sure you closed the project that you want to convert as a project baseline, for instance, “1PRC Refinery Plant Construction (Baseline)” is closed (see above picture) before converting into a baseline. Otherwise, you are not allowed to maintain baseline. Remove the baseline if the project that you want to convert as a baseline has a baseline. Otherwise, you are not allowed to convert it into a baseline. (D) Re-name the baseline name for clear identification, for instance, “Refinery Plant Construction-Baseline – 12 Jan 2013” instead of Refinery Plant Construction-B1. This will help you to identify when your baseline is established. See Fig-2 above. 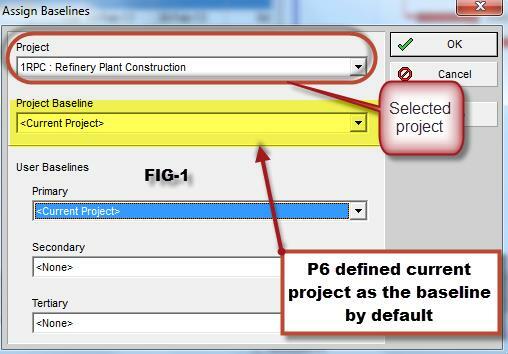 (E) Select Baseline Type – Select "Initial Plan" from the drop down list (see picture below) if you intent to submit your project plan for client approval. It helps you categorize for the different type of baselines. If you are not satisfied with P6 default baseline types, they can be modified and added with your prefer terms if you have administrator privilege. To do that, go to “Admin” on menu bar, then select “Admin Categories”, finally select “Baseline Types” tag. 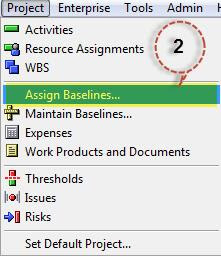 Then, “Assign Baselines” box will appear as shown in Fig-1 above. 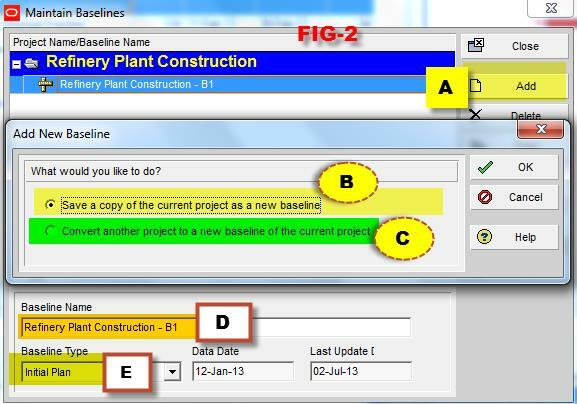 (A) “Project Baseline” for customer sign off (contract approved) schedule prior to data date changes or progress updates so as your project team member can see what your contract schedule looks like is. See Fig-3. (B) “Primary Baseline” for the revised schedule or last updated one so as to compare with current progress status. See below. Read more about “Project Baseline” and “Primary Baseline” for details. That’s it. Now you can compare the current project status against the baseline. Baseline date will no longer change with the Data Date changes. Once all of above steps are done , you should be able to see baseline bar against current plan with your activity layout. if you are having a hard time with showing baseline bar, learn more at How to Show Baseline vs Current Project on P6 Gantt Chart.